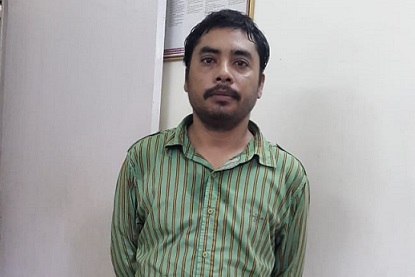 The Chandmari Police in Guwahati apprehended a fraud in the wee hours of June 25 for allegedly being involved in cheating people by winning over their confidence by luring them for Government jobs. The 38-year-old accused, who has been identified as Nabajyoti Bezbaruah alias Ganesh, was apprehended by Chandmari Police from Nabagraha Road in Silpukhuri area. The accused hails from Silpukhuri area in Guwahati. “There was a total of 11 arrest warrants against him since 2012. There are also a number of cases at Chandmari Police Station against the culprit. Finally, we nabbed him,” said Deka. Three different cases (Case No 72/18 under Sections 406 and 420 of Indian Penal Code (IPC), Case No 557/18 and Case No 559/18 under Sections 406 and 420 of IPC) were registered at Chandmari Police Station against the accused. Later, the accused was produced in the Kamrup (Metro) district magistrate’s court which sent him to judicial custody.